My grandfather was a railroad man on the Southern Pacific; my father a model railroader with a setup that filled the two car garage. I didn’t follow them but have a good portion of interest in clanking wheels and rods, screeching noises, oil and grease, complex switch yards and three hundred ton behemoths moving at death defying speeds. 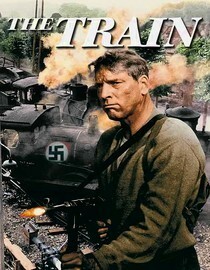 It’s a wonder I didn’t hear of, much less see, The Train, (1964) an extremely well done John Frankenheimer film starring Burt Lancaster as the hell for iron hero of the French Resistance, yard boss and train engineer, in the closing days of the Second World War. This is not just a movie using an old train winding prettily through the green mountains, or speeding across a prairie with bandits in pursuit. This is a TRAIN movie with all its coal and oil, its complicated turning metal wheels, whistling steam and massive engines. This is of men who never get out of soiled clothes and the color of whose faces we can never be sure beneath the layers of smudge and grime. Not only that it’s a film of the good guys (a small cell of the French Resistance) against the bad guys (a coterie of Nazi officers) and the attempted theft, as the allies were within days of Paris, of a trainload of great art: Renoirs, Picassos, Degas, Monets. Can it get any better? Frankehemier, who took over after Lancaster forced the firing of Arthur Penn who wanted a more intimate, ruminative film, keeps the tension up from beginning to end: a plea on a small boat from a museum curator to Lancaster’s Reistance cell to stop the train but not destroy it; the incredulity of Labiche (Lancaster) that she would want men risked to save some “pictures; the wonderful old Papa Boule [Michel Simon] who knows the value of the art, and what it means to the French identity, and who defies Labiche by arranging a bit of sabotage for which he his summarily shot; Labiche’s decision to prevent the train crossing the border and the wonderful [improbable] game the Resistance does with switching signage for the towns the train is going through. It is a fine, working man’s thriller. With the incomparable Paul Scofield as the art hungry Nazi Von Waldheim and Jeanne Moreau as the inn keeper who risks her life to help Labiche, how could you go wrong? There is some gratuitous Nazi violence at the end, just to make the point clear and the face off between Labiche and Von Waldheim after a daring sabotage run derails the train once and for all, is inspired. Oh, and the train pile-ups, several of them, are all real. No models used. Trains Magazine’s special issue, “The 100 Greatest Train Movies,” ranked this as number one. Jon Voight and Eric Roberts both earned Oscar nominations for their acted-to-the-hilt roles as a hardened, legendary criminal (Voight) and a not-so-bright young bank robber (Roberts) who escape from a maximum security prison in Alaska. They hop on board a train, thinking it’s their ticket to freedom, but they don’t know the engineer’s just died! The train just keeps speeding up and there’s no hope of stopping it, or outrunning the vindictive warden who’s in hot pursuit.